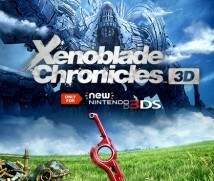 Xenoblade Chronicles 3D is a game available exclusively for New Nintendo 3DS and New Nintendo 3DS XL. What did you think when you saw the game you had made on a portable device for the first time? Yes, it was ported really well. When the subject first came up, I wasn’t sure if it could really be done. Monster Games42, from the US, which is a long-time partner of ours, did the porting for us. When we first talked about porting the Wii game Donkey Kong Country Returns to Nintendo 3DS43, there were even people within Nintendo who said, “That would be amazing, but can it really be done?”42. Monster Games: A game development company based in Minnesota, USA. It created the 3D port of Xenoblade Chronicles for New Nintendo 3DS and New Nintendo 3DS XL.43. A 3D port: Donkey Kong Country Returns 3D was released for Nintendo 3DS in May 2013. But the people at Monster Games solved each issue that was causing the project to bottleneck one by one, and ended up getting the game to work very quickly. 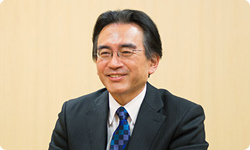 The staff from Retro Studios44, who had made the Wii version of the game, were shocked when they saw it. We were also surprised, but impressed with how well 3D fit the game.44. Retro Studios: A game development company in Texas, USA. Founded in 1998, the company has worked on the Metroid Prime series (Nintendo GameCube and Wii), Donkey Kong Country Returns (Wii) and Donkey Kong Country: Tropical Freeze (Wii U). It’s wonderful to see it in stereoscopic 3D. It really is. We asked Monster Games to do the porting for us because Monolith Soft was already working on Xenoblade Chronicles X. We really would have loved to port it to the original Nintendo 3DS, but it would be difficult with a game like Xenoblade Chronicles. If anything, it’s only the resolution that differs. But otherwise, it’s really got everything. It really is amazing. The other thing I thought was, when we made Xenoblade Chronicles for Wii, we never even thought about putting it on a Nintendo handheld. (laughs) But it does take time to play Xenoblade Chronicles, which means that it’s a really good fit for a Nintendo handheld, because you can stop at any point. So we’d really like people to pick it up who love games but don’t have the time to stay planted in front of their TVs, but would be able to play it on a Nintendo handheld. Finally, Takahashi-san, could you tell people who haven’t played Xenoblade Chronicles yet just what kind of game it is? Alright. This may sound a bit formal and perhaps I should use more casual words, but the game contains all of those elements that we, as developers, had to forgo on other games for various reasons. I feel very confident in saying that you will enjoy playing it. In your life, which has mainly centred on RPGs, you’ve made Final Fantasy, and worked with a young team on Xenogears, and there have been things that you’ve had to forgo for various reasons. But with this game, you were able to do every single thing you wanted to. That’s right. I put in everything that I’ve learned is necessary, in all my work developing games. I always had the impression that Xenoblade Chronicles gathered a particularly high number of compliments from people who played it, but different people also compliment different aspects of the game. I think it’s the fact that there are so many things people are impressed with that makes this game so rich – it really is greater than the sum of its parts, and my impression is that, as you said earlier, the y-axis and x-axis have such a perfect balance, and a lot of depth was put into each side of the game, and that’s why people have reacted to different parts of it. I think that we were able to accomplish that, because each person involved in development thought long and hard about what the game needed, be it in terms of hurdles, quests or storyline. Not only that, but I think it also comes from the fact that everyone was very mindful of what the person next to them was working on while they worked. In development, sometimes people get so involved in what they’re doing that they don’t bother to see what the person next to them is making, especially when the schedule is tight. That’s right. But because everyone was able to work together, and really say, "The person next to me is doing that, so I’ll make sure what I’m doing here backs that up", that’s what helped broaden the gameplay as well, and helped us reach such an overall high standard. Yes, I think it would be a real shame. 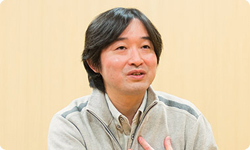 I’d love to talk to you about Xenoblade Chronicles X, coming out for Wii U this year, at another time. Thank you very much for talking with me today.